I write frequently about special dogs and assistance dogs. But this post isn’t about research – it’s about real-life stories where common pet dogs have detected cancer in their owner. For example, I have a client in my massage practice who said that her dog was acting differently towards her. We initially attributed this to stress in the home – since they had recently moved house with all of the associated angst. And then came a diagnosis of bladder cancer and she’s now in the middle of aggressive treatment for it.. On reflection, I believe her dog, who is a sensitive boy, picked up on the scent of her cancer but he didn’t know how to tell her. And then this week, I read about Banjo who lives in North Carolina with his owner, Tim Buckner. Banjo acted strangely to a wart on his Tim’s arm…and when Tim went to get it checked by a dermatologist, he was diagnosed with melanoma. We know that dogs have extremely sensitive noses. And I include here the PBS NewsHour item about dogs and how they can detect cancer. This piece opens with yet another dog owner telling the tale of how her dog detected her cancer. Dogs continue to show us unique ways they can help us and our quality of life. You may have saved your pet, but your pet could also save you. “Some people think that is cruel to use dogs as workers,” says Dr William “Deak” Helton, “but what these people don’t seem to understand is that from the dog’s perspective it is actually crueller if they are not allowed to work.” Dr Helton, who is based at the Department of Psychology at the University of Canterbury in Christchurch, New Zealand, is describing for me his experience with working dogs in Alaska. I wrote about his research in my Canine Corner column this month (NZ Dog World), and here’s some more information about Deak and his research. Deak has been studying dogs for over 12 years and, from those early days growing up in Alaska, he observed that sledding and racing dogs wanted to pull immediately when they were placed in harness. Many people don’t realise, when watching coverage of competitions like the Iditarod, that a large metal snow anchor is used to keep the sled in place as the dogs are secured in their harnesses. A handler that forgets to do this will quickly find his/her sled taken out for an unguided run! Deak has a keen interest in seeing working dogs reach top performance. He described one of his research projects, looking for a way to help screen dogs being considered for a working career:A recent study we did was one in which we measured dogs’ right and left ear temperatures and their ability (based on owners’ reports) to pay attention. The tympanic membrane’s (ear drum’s) temperature is highly correlated with the temperature of the brain on the same side. So differences between the ear’s temperatures may tell you if the dog is more strongly cerebrally lateralized than another. Dogs (like people) have two cerebral hemispheres, one right and one left. Most people are aware that they have a dominate hemisphere (are lateralized). Dogs also differ in their degree of lateralization (how strong one side is compared to the other). Neuroscientists have hypothesized that being strongly lateralized (having a dominate cerebral hemisphere) is actually helpful to the animal in coordinating its behaviour. Imagine having two brain hemispheres both trying to tell your body what to do, without having one as the “leader,” the system may be prone to confusion. Hence, dogs with stronger cerebral lateralization may be better able to pay attention. The less lateralized dogs may be more prone to conflicting cues (distraction). Difference in right and left ear temperature may be an objective measure of cerebral lateralization. There have now been several studies showing that dogs can be used to detect various medical conditions, for example, cancers. When you compare detection capability across tests/technologies you have to look at both the correct detection rate and the false alarm rate of the different tests. Dogs have been trained to detect the presence of breast cancer by smelling the patient’s exhaled breath. The principle is essentially the same as breath analysis to detect alcohol consumption. The patient breathes into a tube that traps the chemicals exhaled in their breath. The dog then is presented with these breath samples and has been trained to signal when one of them has cancer related chemical compounds (it might not be that the dog is smelling cancer per se, but some related chemical excreted by the body as a reaction to cancer). McCulloch and colleagues (2006) have trained dogs to do this task (detect breast cancer via breath samples), and the dogs after training demonstrated a correct detection rate around 88.0% and a false alarm rate around 2.3%. This is not perfect, but for comparative purposes, in the medical literature, mammography screening by professional radiologists for breast cancer typically has a correct detection rate around 86.6% and a false alarm rate around 3.2% (Banks et al., 2004). A higher correct detection rate and lower false alarm rate means an overall better detector. The dog definitely looks promising. Keep in mind mammography is also considered by many to be uncomfortable and some people are concerned that the procedure itself may have side effects. This may put off people from doing the test. The key with cancer is probably early detection. If people are afraid of the test, they aren’t going to do it until they feel so bad they have to and by that time it might be too late. Dog detection (since the dog doesn’t have to even be in contact with the patient) is generally non-invasive. For detecting intestinal cancer the difference in screening may be between a stool sample and having a colonoscopy. The latter is much more uncomfortable than the former. Considering the preliminary evidence and the long track-record of dogs being used in other detection contexts (explosives, narcotics, invasive pests, etc. ), I think the lack of using dogs in medical diagnostic work is mysterious. While dogs will not be a perfect system, people have to realize there are no tests that are perfect. Dogs (or other biological detectors) could be used in conjunction with other tests. There are companies trying to figure out what the dogs are detecting so that they can make technological tests for detecting cancer based on the dog’s ability to detect it, but that is not helping anyone now. Dogs can probably do the job and if the track record in other contexts is informative (for example, explosives) then dogs will probably be able to do the job better than technology for the foreseeable future. Of course we should develop other technologies, but if we want to save lives now, dogs could be used more in this context. 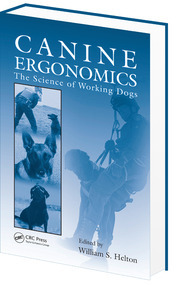 The Editor of Canine Ergonomics: The Science of Working Dogs, a compilation of research from disciplines ranging from biology and veterinary medicine, to psychology and forensic medicine, Deak says “For me, this book filled a gap when you consider how extensive dogs are employed.” The book, published in 2009 has had great reviews. Deak describes his research as the field of engineering psychology, more popularly known as ergonomics. His work in the field of human factors psychology has earned him the 2011 Earl Alluisi Award for Early Career Achievement by the American Psychological Association (APA).